One fine morning, a minister went to Emperor Akbar's court to tell the Emperor some bad news. His gold coins were all gone! They must have been stolen the night before! Emperor Akbar was shocked to hear this. The place where the minister lived was the safest in the kingdom. Surely no one could have broken into the house to steal the coins! It must have been one of the other ministers who lived there, too, who took the coins. But who? The Emperor asked Birbal how to solve the case. Birbal called for a donkey to be tied to a pole at the place where the minister lived. He ordered all the ministers to lift the donkey's tail and say, "I did not steal the coins." Then each of them must come to the palace later that day. 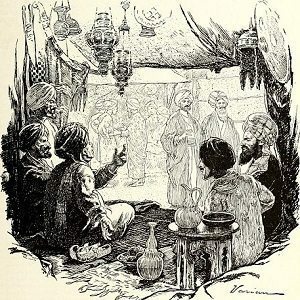 When each of the ministers were at the palace, Birbal said, “Now each of you must turn your hand up, so I can see the palm of your hand.” This was odd and the ministers did not know what to think of it. But they did as they were bid. When Birbal looked at the hand of each minister he saw that each one of them, except Alim Khan, had a black patch of paint on their palm. You see, Birbal had painted the donkey's tail with a black coat of paint! He knew that the one minister who was guilty, in fear, would not touch the donkey's tail. And so once again Birbal proved how clever he was, and he was rewarded by the Emperor with 1000 gold coins.